(Sighetu Marmației, 24.07.2016 - 25.07.2016) Eastwards en route to Sighetu Marmației in the Maramureș region, you will have drive through Certeze. Please drive carefully and avoid any rear-end collision with the vehicle in front when its driver is standing on the brakes spotting an unexpected architectural monstrosity. Many foreign or domestic visitors stop, take photos, more than a few leave shaking the head in disbelief. But, de gustibus non est disputandum, and apparently Dan Vasile, the owner of "Certeze Versailles" made his fortune with nothing but wire?! 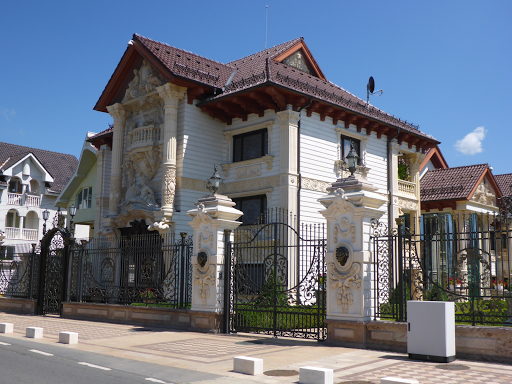 Nearly all buildings in Certeze are characterized by the same gigantomania and mixture of "styles" - of course smaller-scale. Where is the source for this enigmatic prosperity? Andra Letiția Jacob Larionescu is offering the following striking explanation: "It is the case of Certeze (a village in Oas County) and its environs, where a great majority of the peasant population migrated on the periphery of Paris, being involved with street newspapers. The housing situation of these migrants, in the host country – France -, differs greatly from that of the native village: to accumulate the money so necessary to build a house in the country of origin, the villagers live in abandoned houses, on the outskirts of Paris. 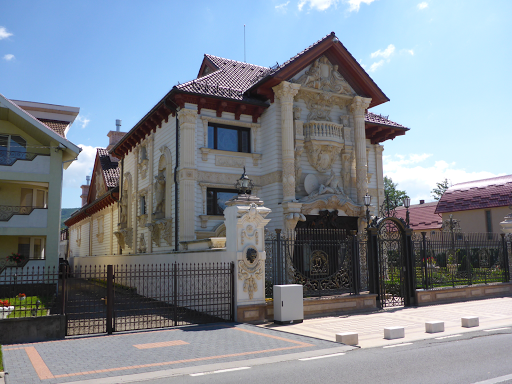 With such sacrifices, they succeeded to regularly send money to their families left behind in Romania, resources that were invested in housing." 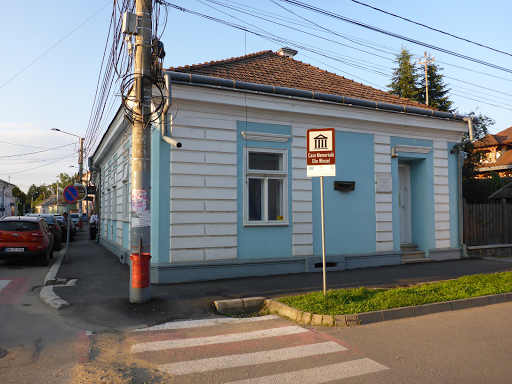 In Sighetu Marmaţiei the Elie Wiesel Memorial House in honour of Holocaust survivor and Nobel Peace Price Laureate Elie Wiesel opened in 2002 in his birthplace. 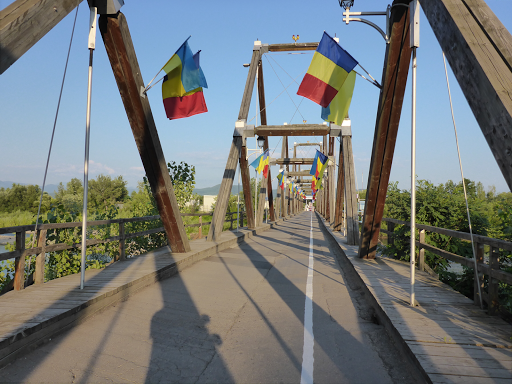 The small bridge over the Tisza is for all Maramureș and Bukovina visitors a beneficial "architectural highlight": The Sighetu Marmației-Solotvyno border crossing joins northwest Romania at the town of Sighetu Marmației with southwest Ukraine at the town of Solotvyno. 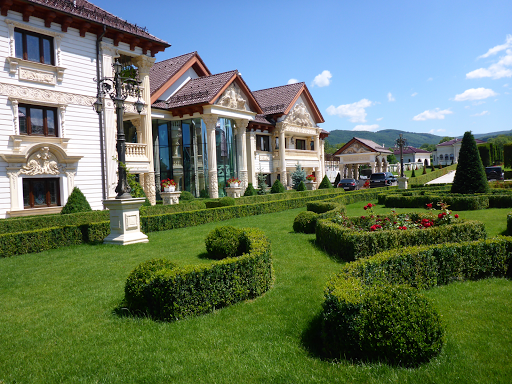 The Romanian side is located in the Maramureș region and the Ukrainian side in that country's Zakarpatska oblast. A hidden, but nevertheless time-saving alternative pathway to Bukovina too! "Involved with newspapers?" They must be kidding. Even in those areas of Europe you need a substantial amount to build such "pretty" houses.It comes from begging and theft most probably. Thank you Edgar, for letting us accompany you on your exciting travels. Love riding with you - can't wait to meet up in a few weeks in Czernowitz!